In this Live Stream we take a quick look at a few new products that have arrived at Airbrush Asylum, SharpenAir and Sagola. Check out Part 2 of our Stretchy Skulls tutorial video. In this 'how to' video we show you how to airbrush stretchy skulls on an aluminium composite panel. The video will teach you how to make your own freehand skull templates using paper as well as rendering the skulls using transparent black over a silver base. We hope that you enjoy this instructional video and remember to watch both Parts 1 and 2 so that you get the most out of this step by step tutorial. Check out Part 1 of our Stretchy Skulls tutorial video. In this Live Stream we take a brief look at our airbrush collection which we use to create all of our day to day artwork. We are excited to announce that in conjunction with Advanced Airbrush we are the Australian Distributor for SharpenAir. 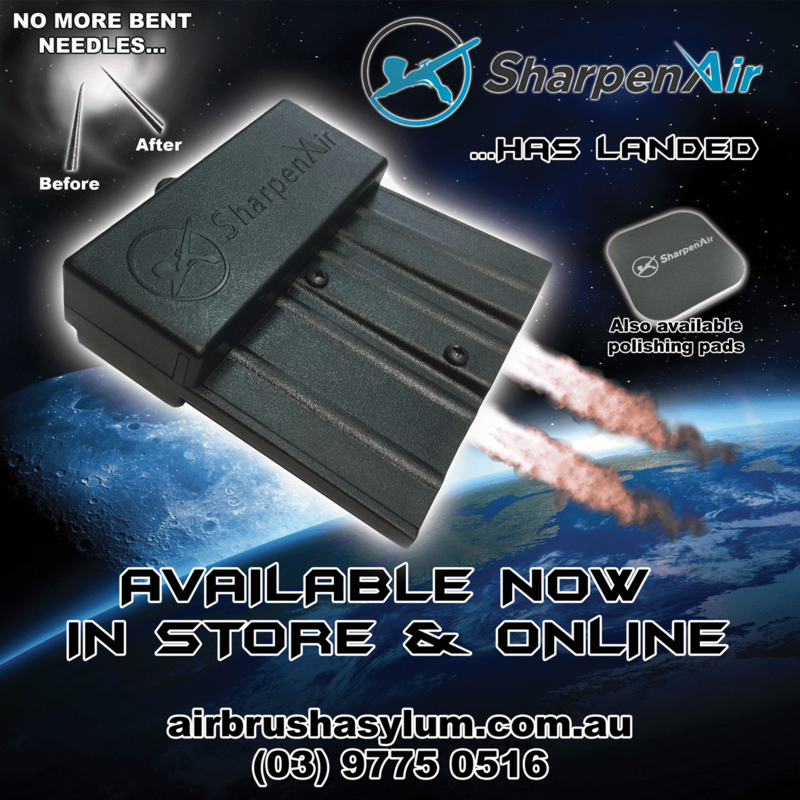 Available both in store and online is the SharpenAir needle sharpening tool as well as the SharpenAir 3000 grit polishing pads. For more info or to purchase, click on the following links which will take you straight to the product via our online store, you can also arrange a time to drop into our shop and see the product and it's benefits first hand as well as check out all of our other airbrushing supplies.